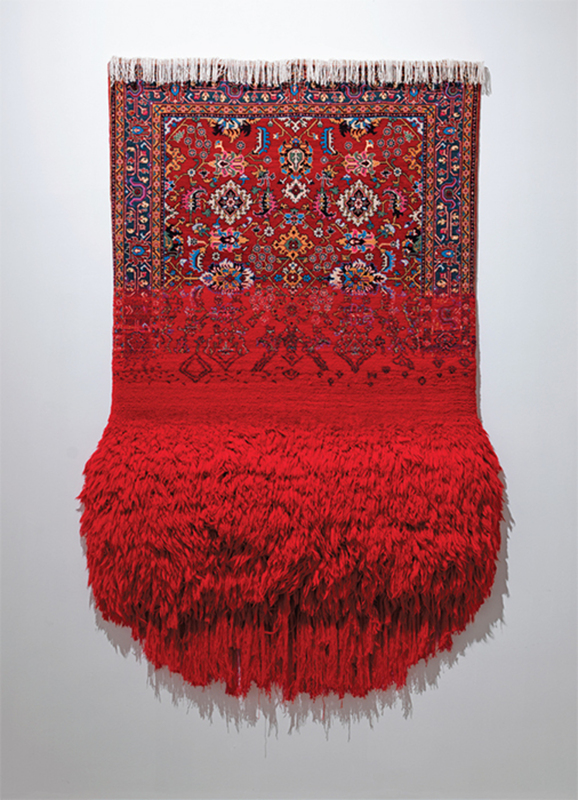 Faig Ahmed, Bakirə (Virgin), 2016, wool carpet, 118 1/8 × 59". To enter Faig Ahmed’s exhibition “Nə var, Odur” (It Is What It Is), you had to pass through Aramızdakı pərdə (Curtain In-between, all works 2016), a threshold of diaphanous drapes embellished with gold embroidery. Inside, you encountered exiting visitors as ghostly apparitions gradually emerging from behind the layers until they were suddenly right in front of you. This transformation reverberated throughout the show as a metaphor for the veiled mechanisms of control that serve to cohere (and divide) communities while conferring a tribal identity.